Parents’ names unknown; immigrated as a young man in 1868 with his sister Minnie. Husband of Augusta Zimmerman, married December 6, 1874. 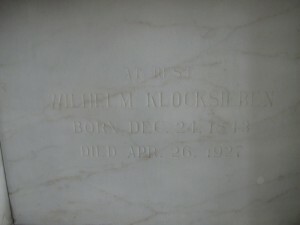 William Klocksieben was born December 24, 1843, at Mecklenburg-Demin, Germany. As a young man he, together with his departed sister, Minnie, came to America in 1868. After a short stay in Chicago, he went to Elgin, where he remained five years. From there he came to Grant Park, locating on a farm four miles northwest. On December 6, 1874, he was married to Augusta Zimmerman, Rev. Albert Wangerin Officiating. This union was blessed with ten (correction 12) children, of whom three, William, at the age of 20, Emma at the age of 38, and Rudolph, at the age of 32, preceded him in death. The surviving children are; Anna, Mrs. Paul Nehls, Kenosha Wisconsin; Herman, Grant Park; Robert, Crete; Augusta, Mrs. Adolph Pralle, Crete; Sophia, Mrs. Albert Piepenbrink, Crete; Alvina, Mrs. Charles Weber, Glen Ridge, NJ and Minnie, Mrs. Howard Orris, Chicago Heights. 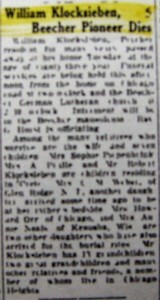 Ten years ago (1917), Mr. and Mrs. Klocksieben left the farm and located in Beecher. Two years ago (1925), while crossing the Dixie Highway, Mr. Klocksieben had the misfortune of being knocked over by a passing car, from which accident he never fully recovered. About three weeks ago old age infirmities compelled him to take to his bed, which in spite of the best medical skill and tender care and loving nursing by his wife and daughters, became his deathbed, passing away peacefully at the ripe age of 83 years, 4 months and 2 days. He is mourned by his wife, the children already mentioned, 14 grandchildren, two great grandchildren and a host of other relatives and friends. Funeral services were held, Friday, at 2 o’clock at the house and 2:30 at St. Luke’s Church, where Rev. G. Horst spoke in both the German and English languages befitting the occasion. The service was beautified by many floral pieces and two solos rendered by Mrs. Herman Polson of Chicago Heights, ably accompanied by Mrs. Frank Hunte, organist of St. Luke’s congregation. The remains were laid at rest in the Beecher Mausoleum. In the passing of Mr. Klocksieben, Beecher and vicinity lost one of its oldest residents, whose honesty and integrity was respected by all who knew him. William Klocksieben Beecher resident for many years passed away at his home Tuesday at the age 83 years. Funeral services are being held this afternoon from the home on Chicago Road at 2 o’clock and at the German Lutheran Church at 2:30. Interment will be in the Beecher Mausoleum, Rev. G. Horst officiating. Among the many relatives who survive are the wife and seven children, Mrs. Sophia Piepenbrink, Mrs. A. Pralle, Mr. Robert Klocksieben are children residing in Crete. Mrs. C. M. Weber of Glen Ridge, NJ, another daughter, arrived some time ago to be at her father’s bedside. Mrs. Howard Orris of Chicago and Mrs. Annie Nehls of Kenosha, Wisc. are two other daughters who have also arrived for the burial rites. Mr. Klocksieben has 13 grandchildren, two great grandchildren and many other relatives and friends, a number of whom live in Chicago Heights.